Perhaps it’s an irony of fate that the only development work that is still generating income, namely the camera-tripod Stabil, is a product that Jan Karlsson’s father was the original inventor of. – My father photographed himself and developed the tripod 15 years ago in co-operation with other photographers, Jan says. The tripod received a lot of positive remarks and a photo-magazine wrote about it. This lead to so many orders that for a while there was a 1-year delivery time. – When my father passed away a few years ago I continued the manufacturing. The success of the Stabil-tripods, the “secret”, is their sturdiness. They can carry heavy cameras and lenses up to 15-kg (33 lbs.) without vibrations and without causing image-unsharpness. The fact that they are mainly made of wood, namely American oak, makes them even better. This is a well-known fact to all nature-photographers that barehanded have used metal-tripods during a cold winter. A wooden tripod is more comfortable to deal with. They are also beautiful to look at! The Swedish photo-magazine Foto compared, in 1998, over 40 different tripods and tested them for stability and handling. 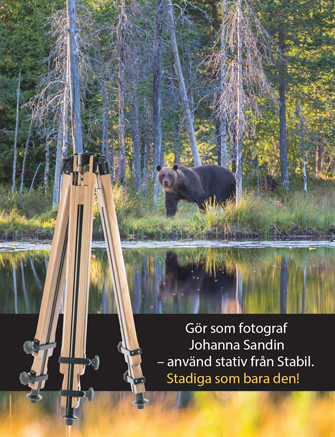 Jan Karlssons Stabil-tripods received the grade “Top-class”. Better publicity is hard to find and during 1998 he has sold over 100 tripods, ordered directly by photographers from all over Scandinavia. – For me this manufacturing is an excellent complement to my contract work. – Sure, there is a lot of work with the tripods at nights and during winters. However, during periods of standstill I can devote the time to the tripods, put up a stock and sell during the rest of the year, he says. The manufacturing and marketing of the tripods also provides a welcome change to the other work. Jan regularly visits photo-exhibitions for the publicity. Many photographers get in touch to ask questions about the tripod or to suggest changes and improvements. – This is the way it works, Jan says, that I get comments, suggestions and ideas from the photographers. This leads to a continuous development of the tripods. Jan’s diverse experience of technique, construction and practical solutions, acquired over the years, comes in handy all the time.